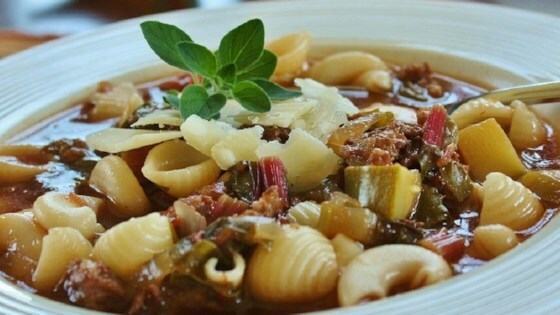 "This is one of my favorite soups and it always gets rave reviews! Salad, hard rolls and wine make a meal! You can make this 24 hours ahead of time without the noodles and wait to add the spinach noodles until soup is reheated for serving. Yummy! Serve topped with grated Parmesan!" In a large pot, cook sausage over medium heat until brown. Remove with a slotted spoon, and drain on paper towels. Drain fat from pan, reserving 3 tablespoons. Cook garlic and onion in reserved fat for 2 to 3 minutes. Stir in tomatoes, wine, broth, basil, and oregano. Transfer to a slow cooker, and stir in sausage, zucchini, bell pepper, and parsley. Bring a pot of lightly salted water to a boil. Cook pasta in boiling water until al dente, about 7 minutes. Drain water, and add pasta to the slow cooker. Simmer for a few minutes, and season with salt and pepper before serving.